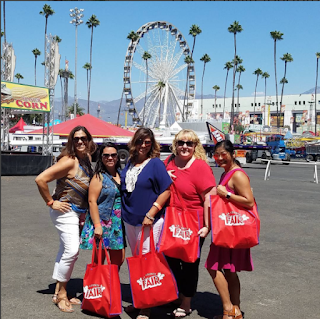 the l.a. county fair officially opens today! 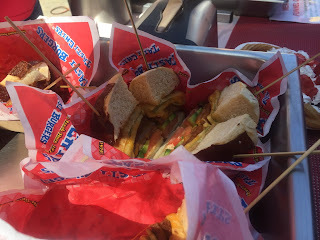 i was lucky enough to be invited to their annual pre-opening media day a couple of days ago. 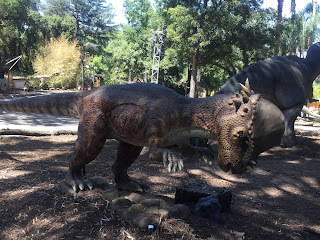 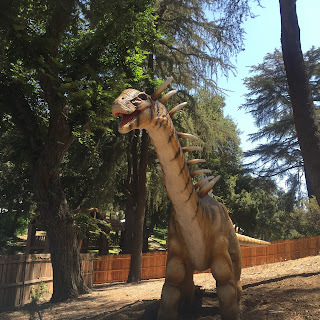 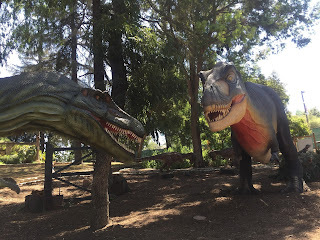 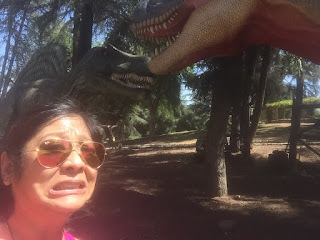 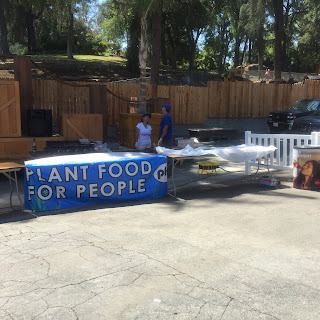 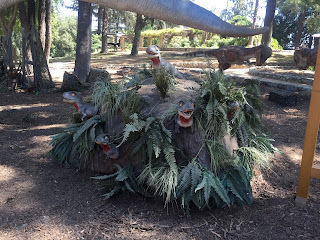 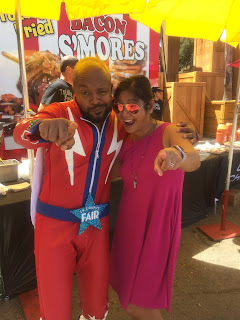 it was hotter than hell out there, but no way was i going to pass up the chance to try some of the fun fair food and check out the dinosaur attraction that's new this year. my friend irma blanco, who's on the morning show for kola fm, was there with a couple of friends too, and we met up at the check-in table. 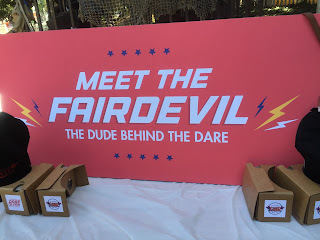 since the party was set up way off in the corner of the fairgrounds, we got to hitch a ride on a golf cart to get there. 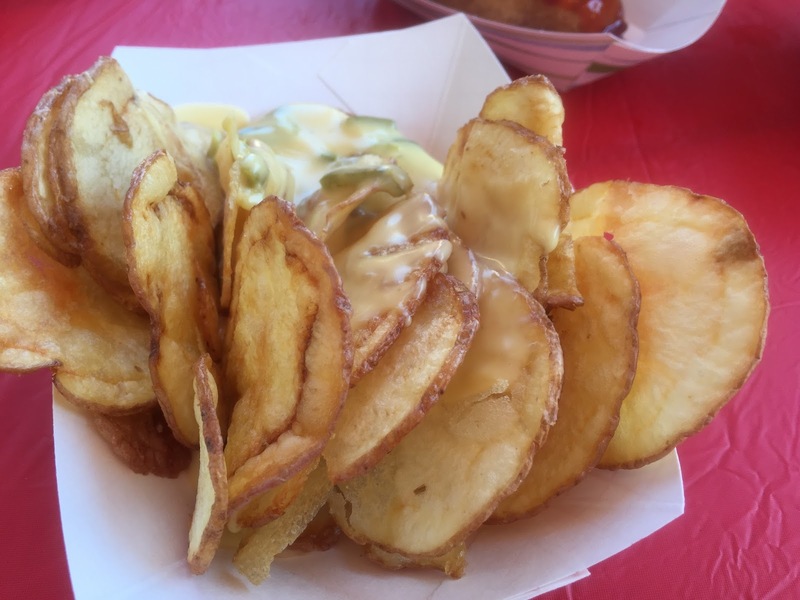 the first table we walked up to was by tasti chips, who was offering a chili relleno pretzel burger and tasti chip nachos - fresh potato chips covered in jalapeño cheddar. 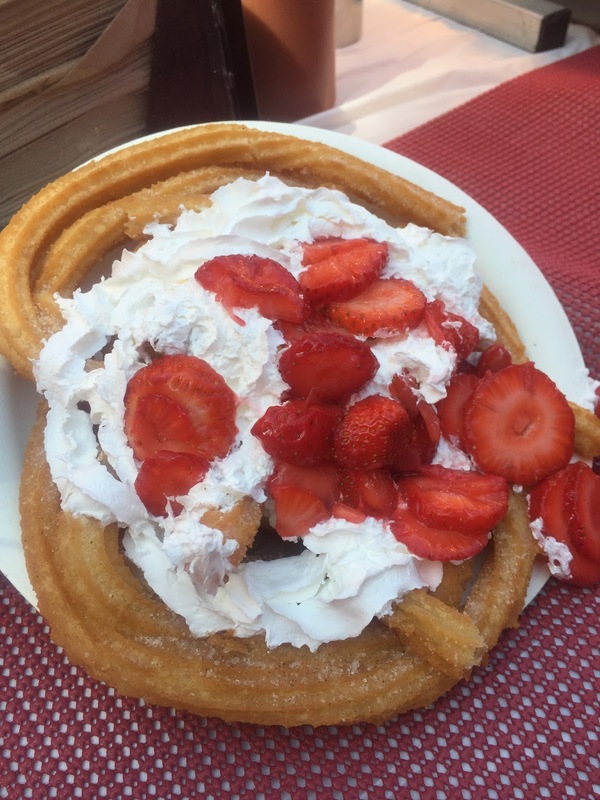 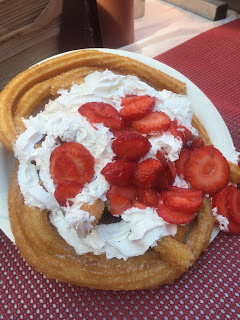 there was also a churro funnel cake, topped with whipped cream and fresh strawberries. 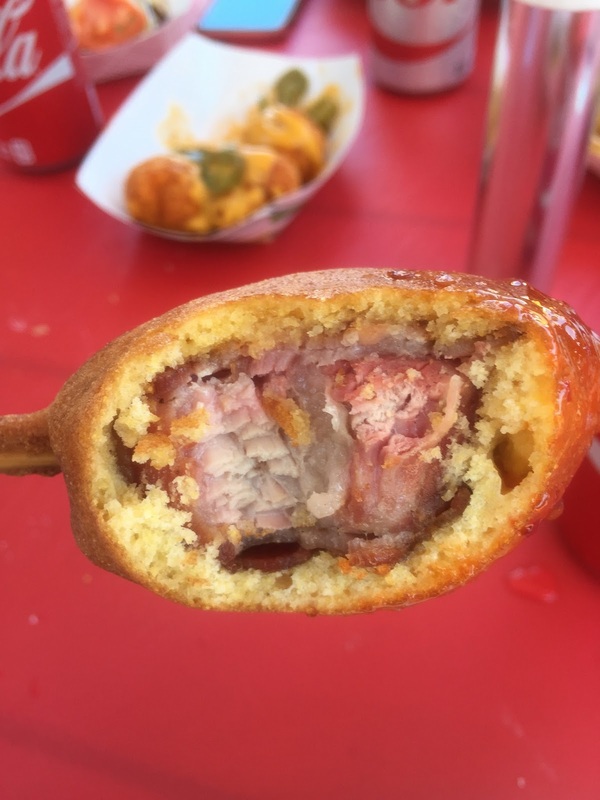 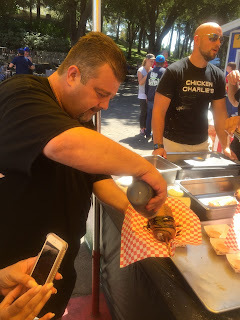 a little further over was biggy's, offering bacon wrapped pork belly corn dogs with a sweet chili sauce. 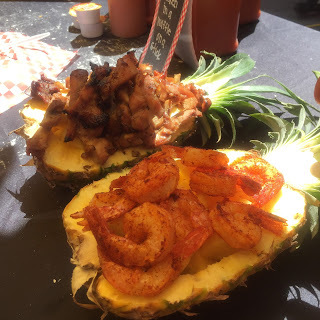 this was really tasty. spud ranch was there with deep fried nachos. 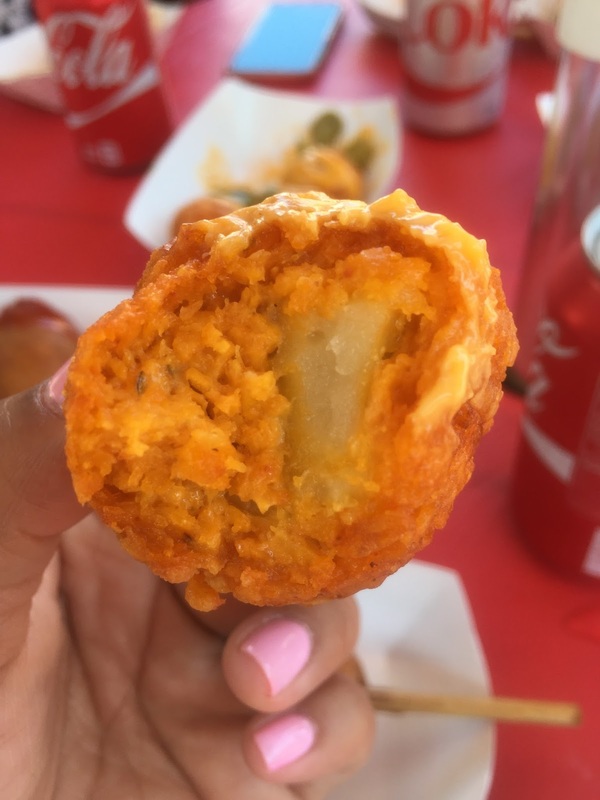 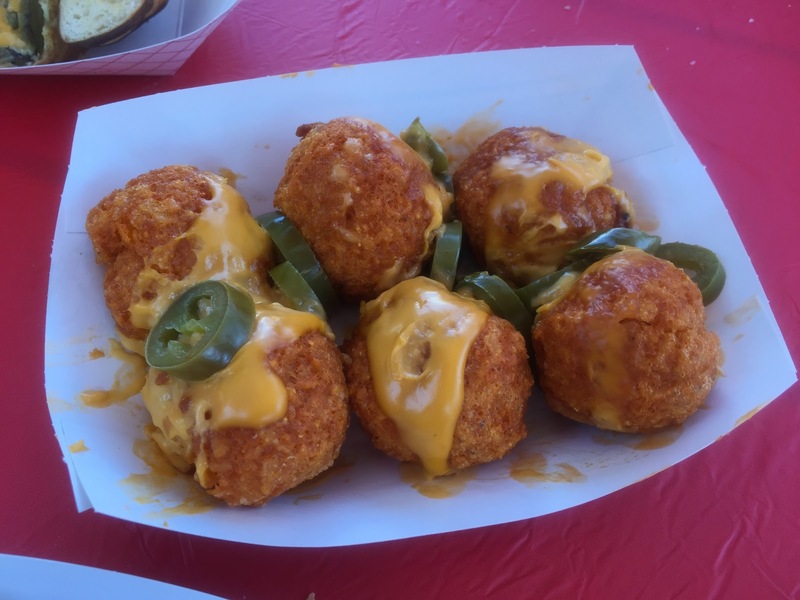 when i took a bite, i found seasoned potatoes and what seemed like crushed nacho doritos, dipped in batter, fried and then covered with cheese and jalapeños. tasty. 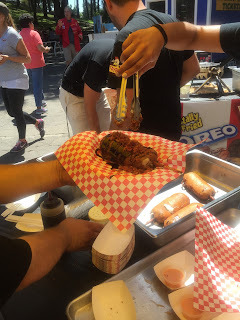 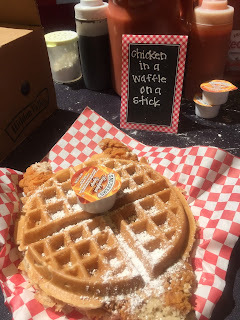 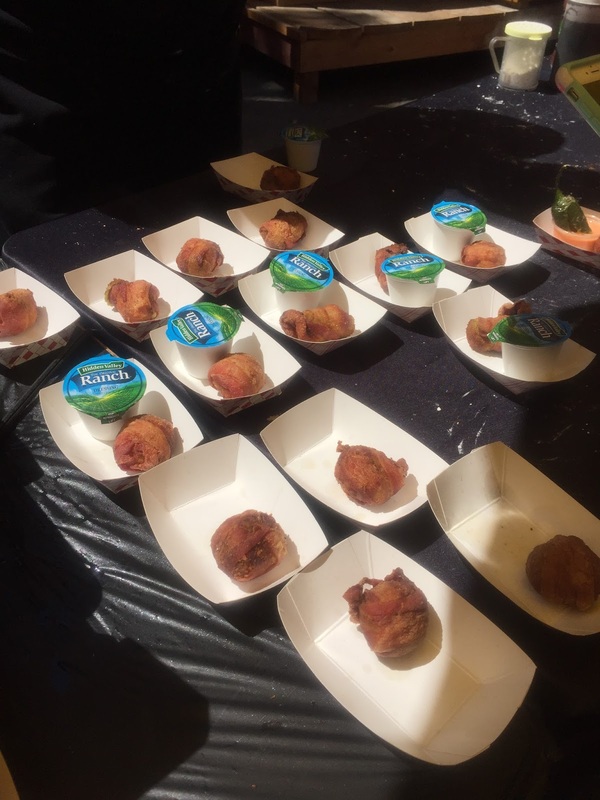 they were offering chicken & waffles on a stick, bacon wrapped chicken legs and deep-fried hot sauce. 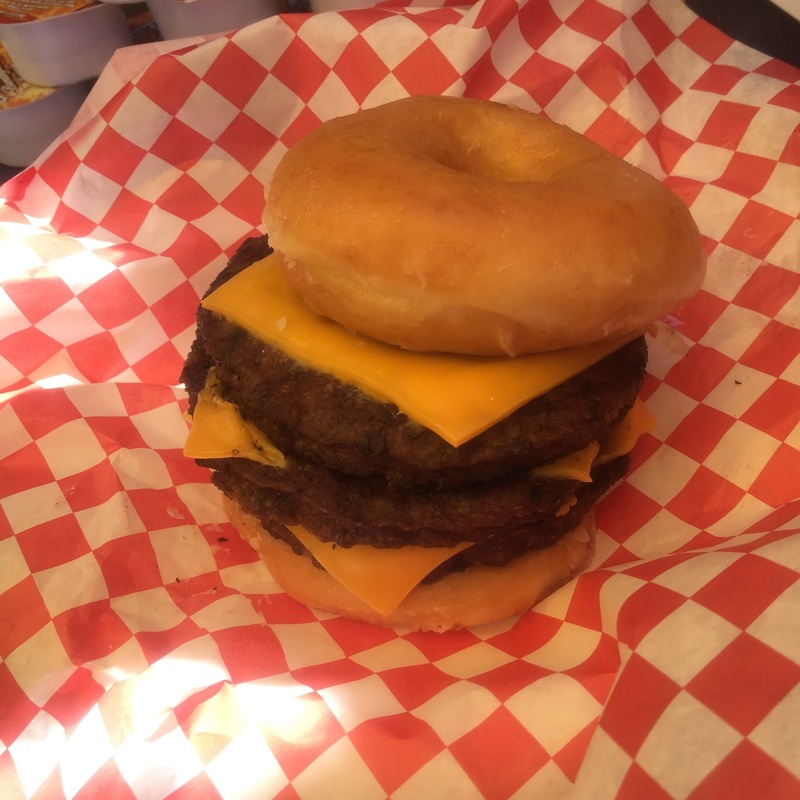 but even better than that...he took us aside and showed us their newest creation. 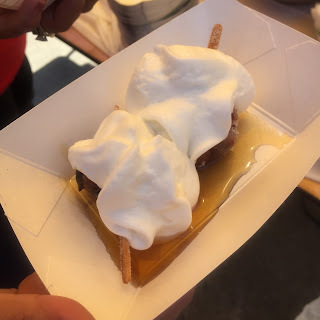 he grabbed something from a nearby bin and started drizzling chocolate sauce on top of it, dusting it with powdered sugar and then had a nice helping of crumbled bacon dropped on top. 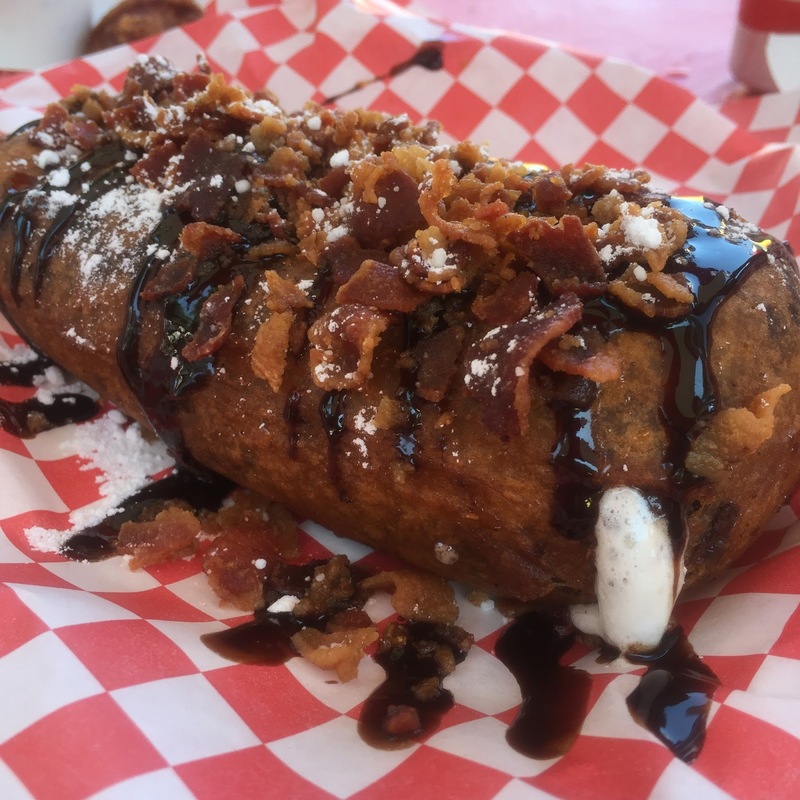 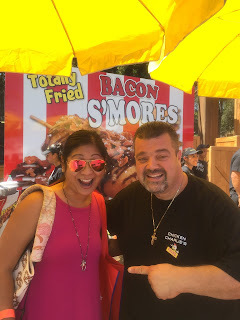 ladies and gentlemen, i give you...deep fried bacon s'mores. oh yeah. 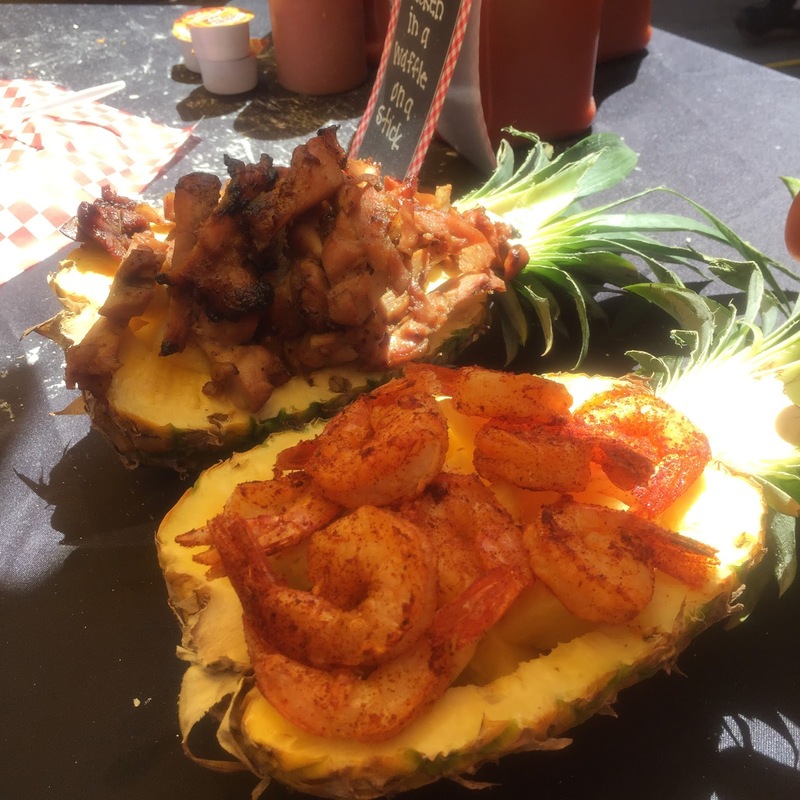 they're also offering the krispy kreme burger and grilled shrimp and chicken served in a pineapple boat. these items were display only for the event, so i didn't get to try any of them...yet. 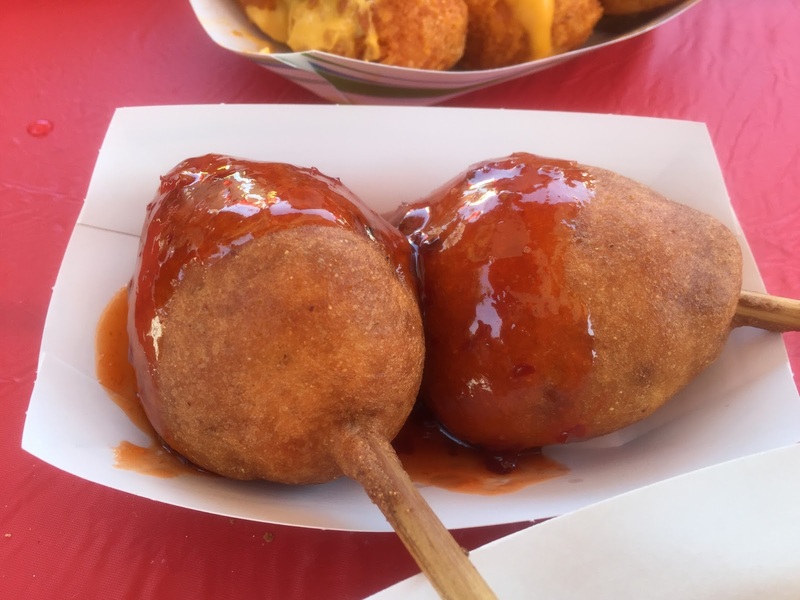 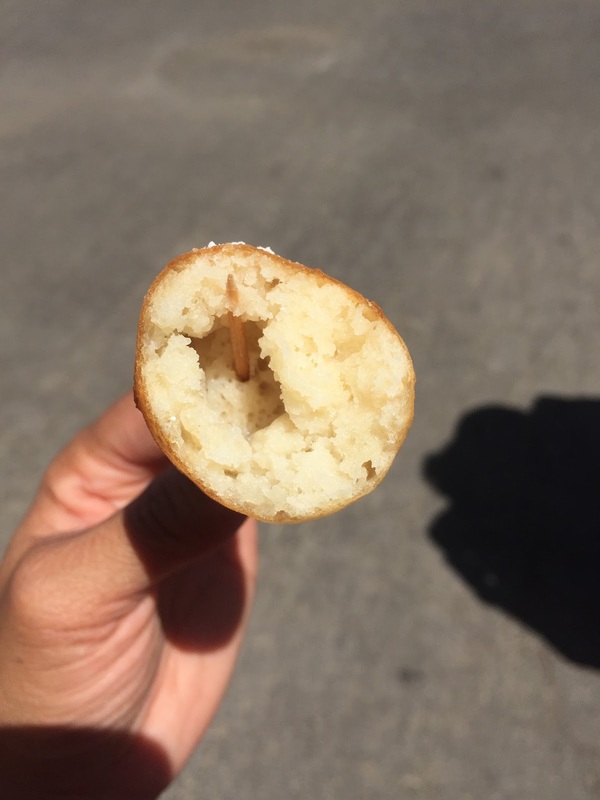 there were deep-fried butter balls, too. 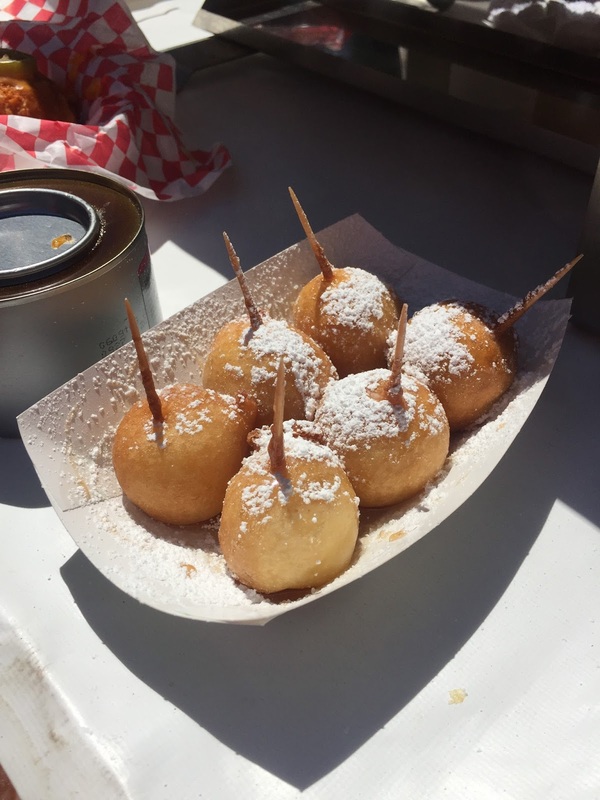 it might sound gross, but i thought they were like super buttery pancake balls on a stick. 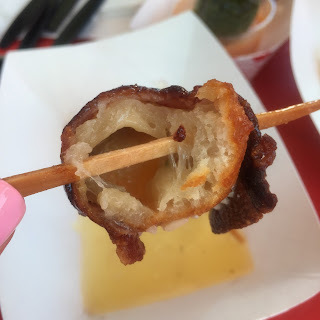 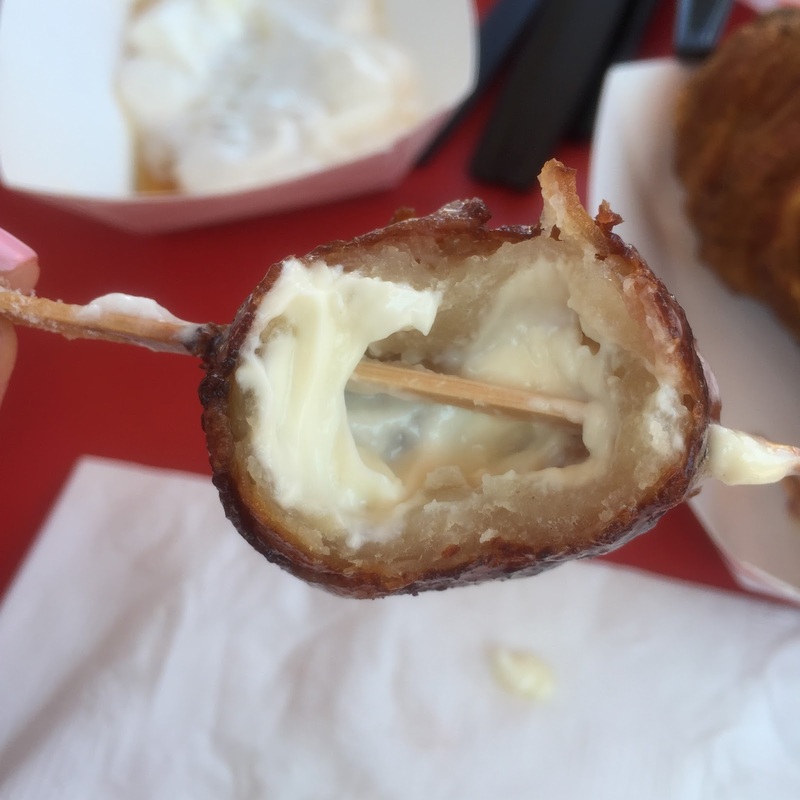 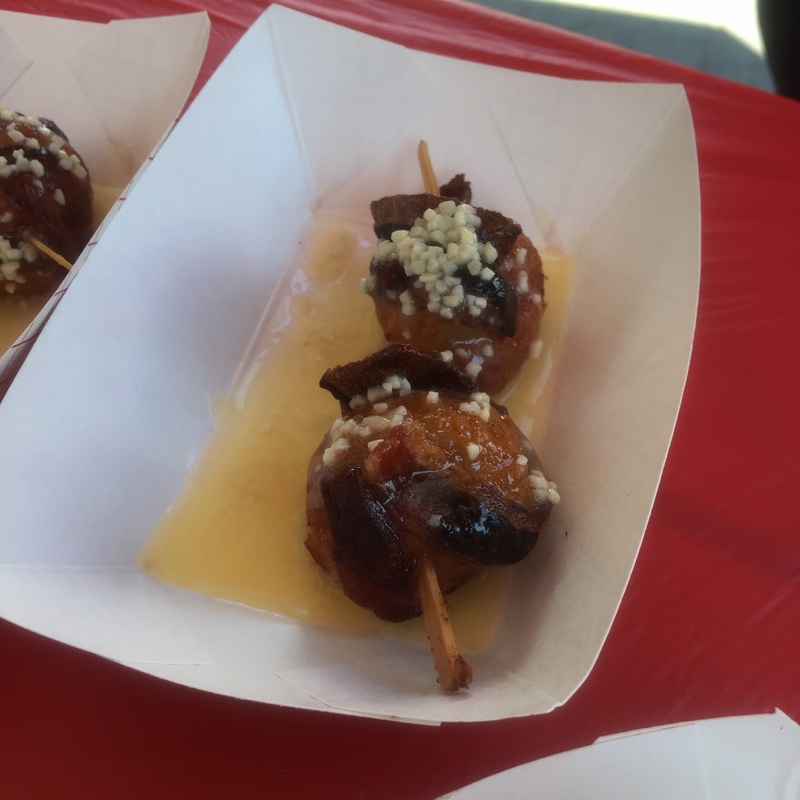 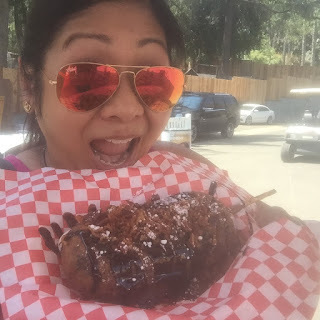 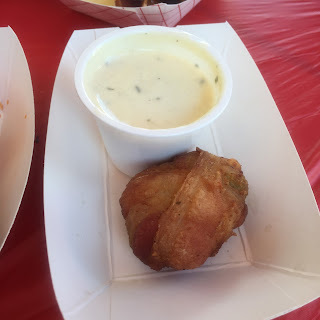 and cheesy bacon bombs, little happy balls of deep-fried cheese wrapped in bacon on a stick. 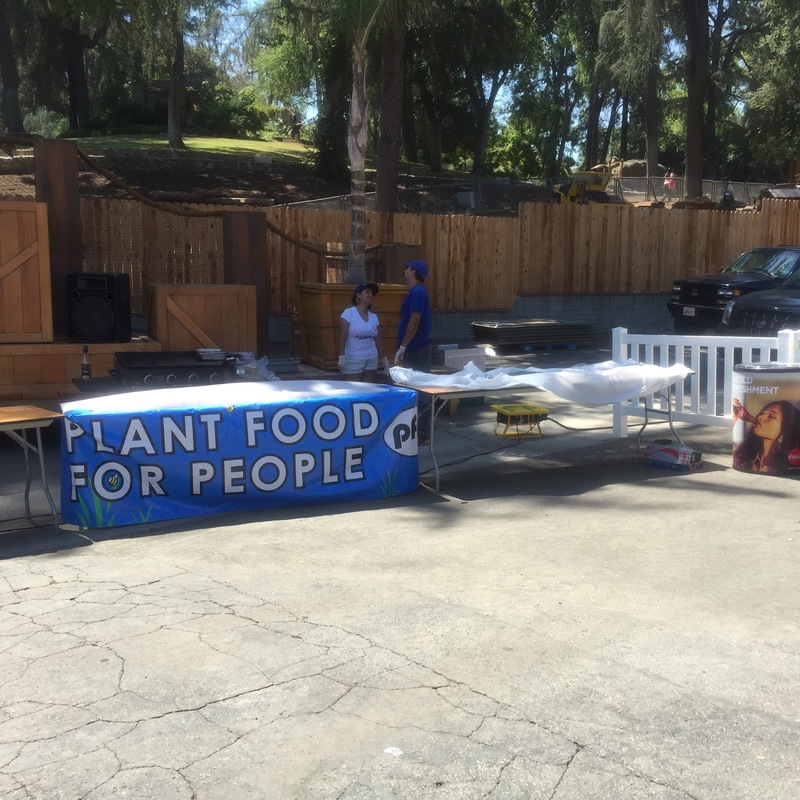 and we all felt bad for this booth, offering vegan jackfruit tacos that most folks were passing up for the super-bad-for-you stuff. 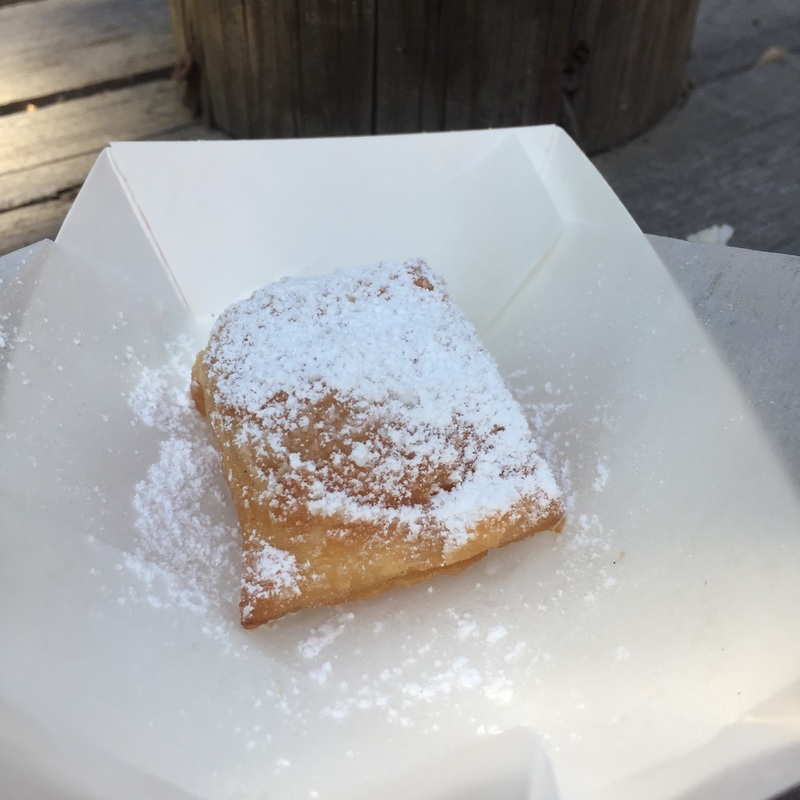 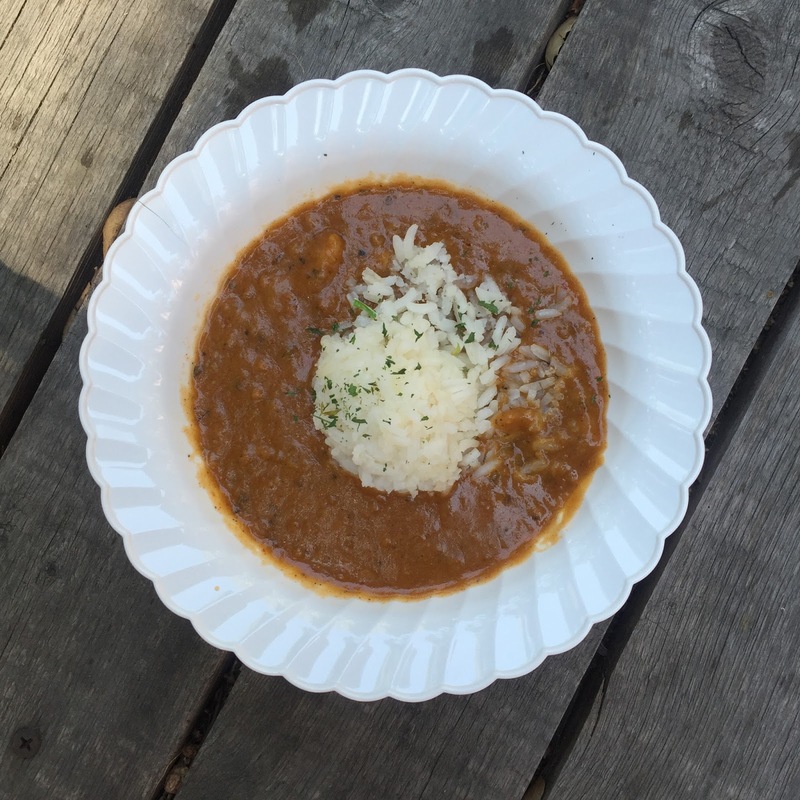 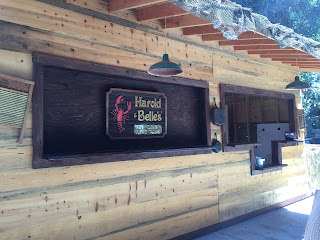 harold & belle's supplied us with bowls of delicious crawfish étouffée and fresh beignets. 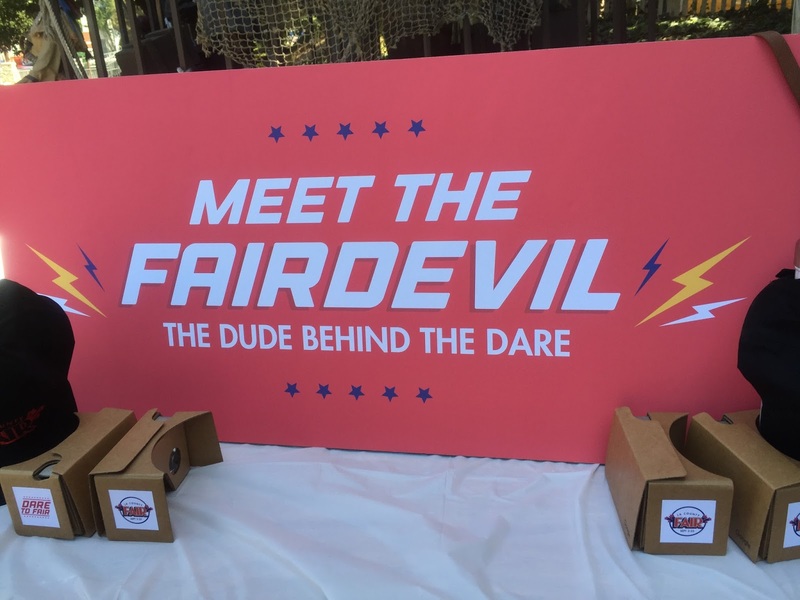 we met the new fair mascot - the "fairdevil," who has a fun music video that we got to watch using a pair of virtual reality goggles. 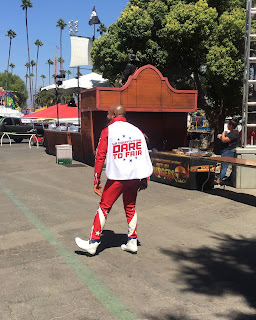 he was super enthusiastic, and i couldn't help but feel bad for him as he strutted his stuff in head-to-toe leather. it was so hot out there and i was literally melting. 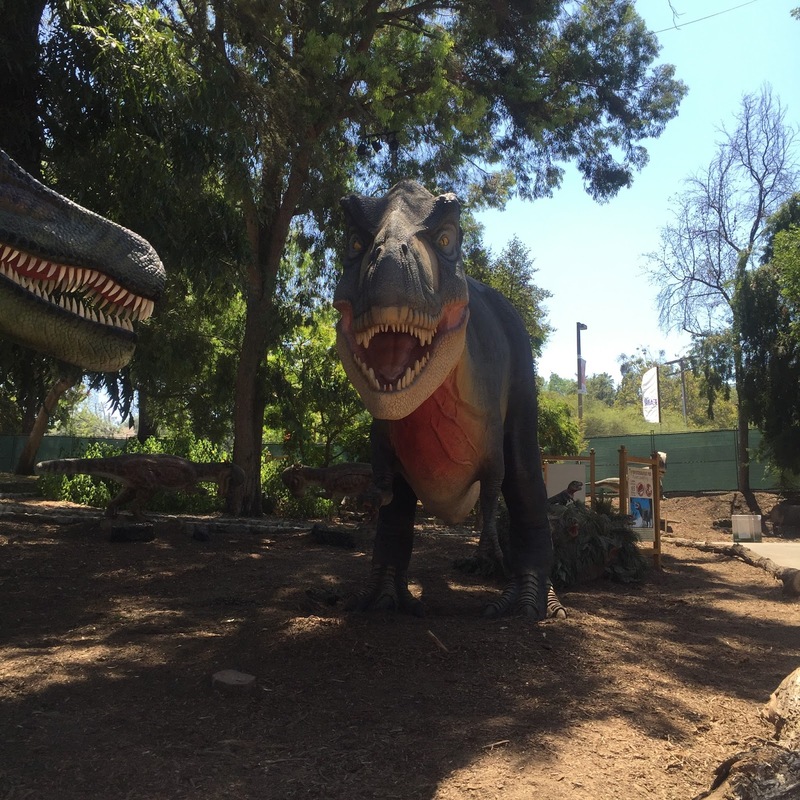 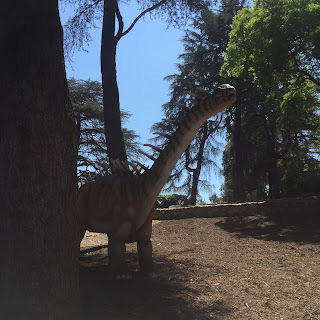 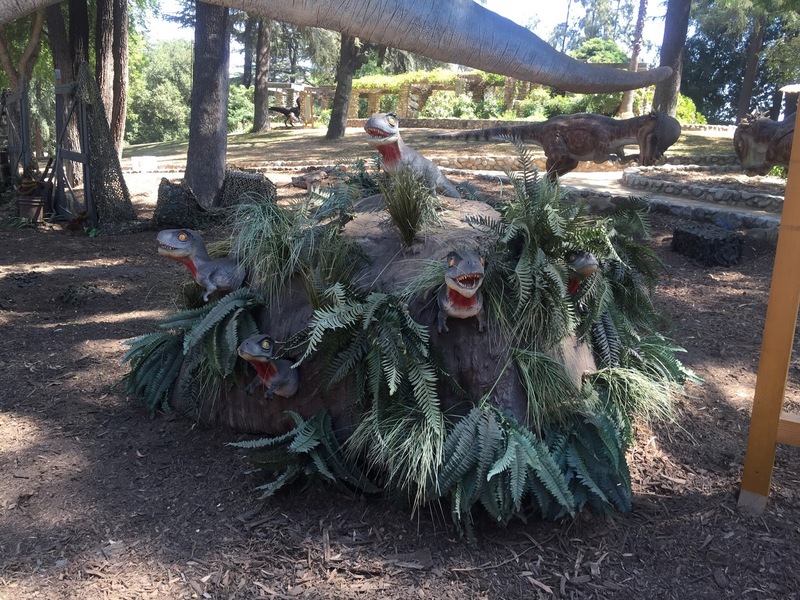 the jurassic planet area is all about dinosaurs and is not included with regular admission. it requires a separate ticket, and while it was cool to check it out, i would probably say that it's really for those who are super duper into dinosaurs. 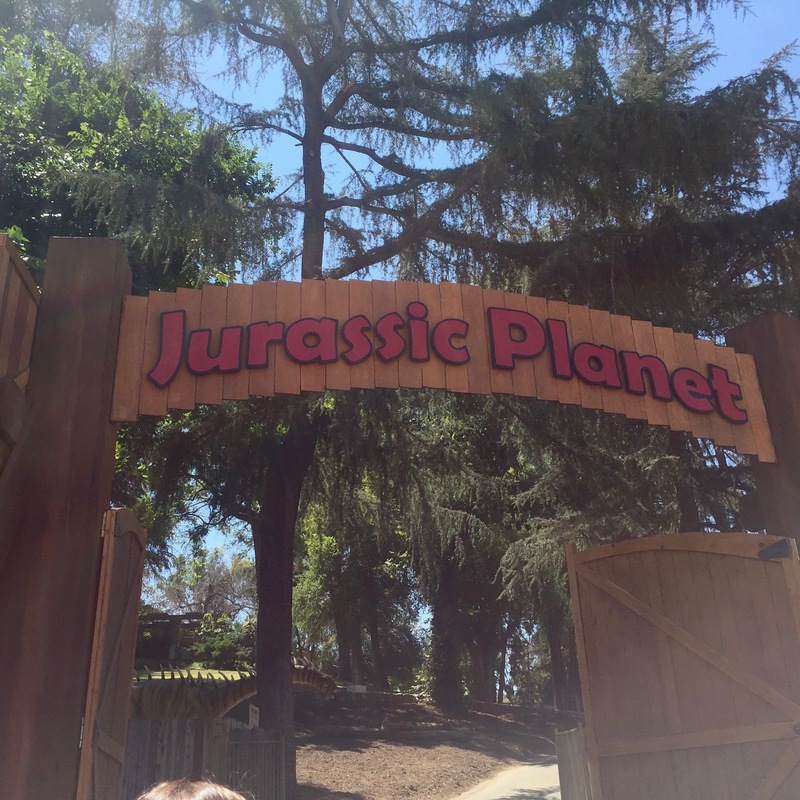 i don't know that i would have paid any extra to see it. 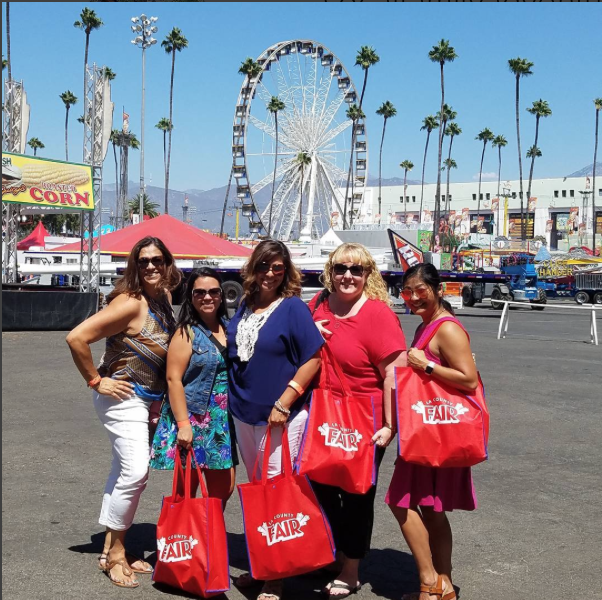 we posed with mary, another local blogger, for a fun group pic. 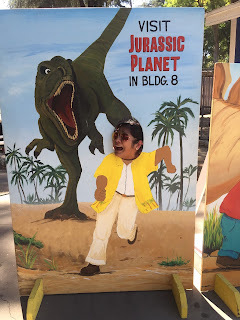 but the bean also entered a drawing she did that we had to turn in way back in july. 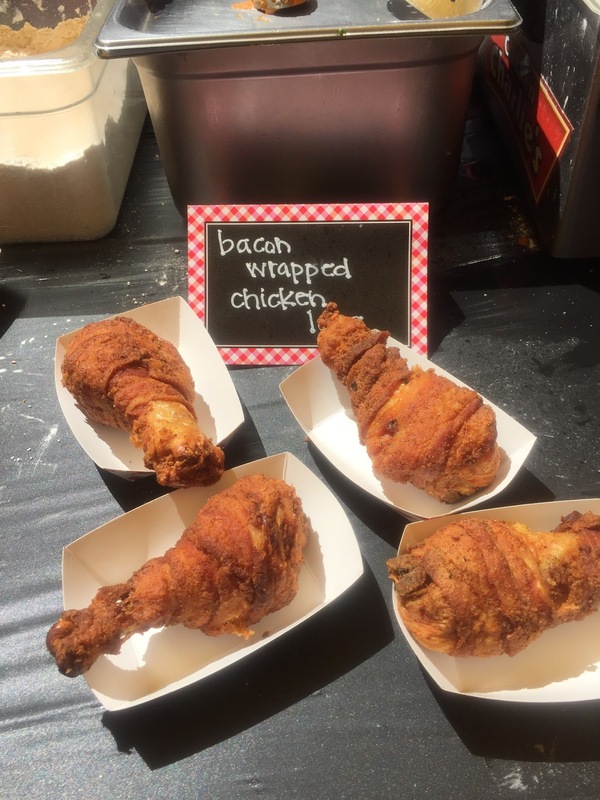 we're all dying to see her work on display, so i think we might brave the crowds and head out on sunday morning for more fair food and to check out our entries. 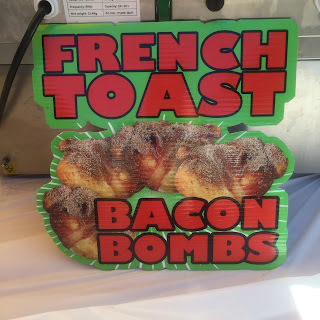 Make sure you take pics of the displays, ok? 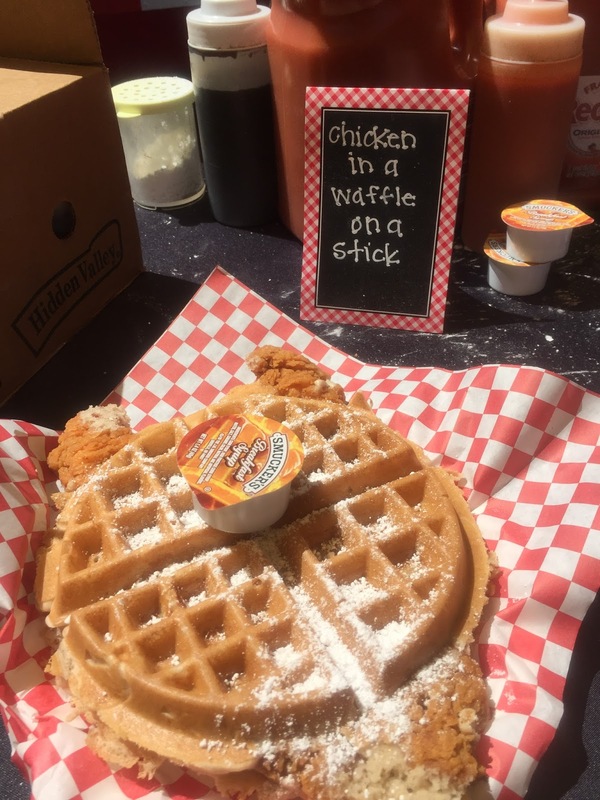 Bean's and yours, please. 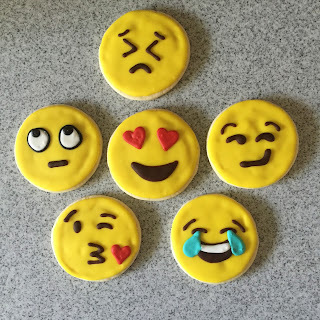 TY.